Thanks to the generosity of The Greater Pike Community Foundation, Peters Valley School of Craft invites the public to attend a series of free artist lectures held monthly at the Pike County Public Library on East Harford Street in Milford, PA.
On Friday, April 26th at 7:00pm, Philadelphia-based textile designer Michael Radyk will give a lecture on his Jacquard weaving and handweaving practice. 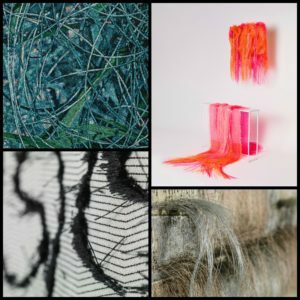 Using primarily recycled, repurposed, and industrially-made materials, Michael weaves, cuts, and manipulates his textiles into both two and three-dimensional forms. His work is included in the Textile Collection of the Cleveland Museum of Art. Michael received his MFA from the Rhode Island School of Design and developed his interest in education and collegiate teaching while at RISD and Brown University’s Sheridan Center for Teaching and Learning. He has taught at SCAD, RISD and the University of Georgia in Athens. He served as the Chair of the Crafts a nd Textiles Area at Kutztown University of Pennsylvania from 2011-2015. He is the former Director of Education for the American Craft Council and was the founding Editor in Chief of the journal American Craft Inquiry from 2015-2019. Visit www.michaelradyk.com for more. This lecture is FREE to attend however be sure to pre-register online or call 973-948-5200 – space is limited!